After a long week of teaching science to his excitable students at Ruskin Christian School, there’s one way Plant City photographer Matthew Croxton likes to unwind. He loses himself in the natural wonder of the Lower Green Swamp Preserve. Croxton grew up hearing about the preserve’s beauty. So, when it was finally opened to the public for hiking and equestrian activities in January, he decided to see it through his lens. Croxton began an artistic quest, ending up with six color images of beautiful scenes from the preserve. The exhibit can be seen at the Bruton Memorial Library until the end of June. Walking down paths shaded by great oaks with rings that could tell the history of time, Croxton snapped hundreds of pictures of the preserve. Among his favorite areas to visit are the cypress stands that dot the land. Croxton’s love of photography stemmed from the Bruton Memorial Library when he was a boy. He enjoyed looking at volumes of books that just contained the works of photographers. The works of German photographer Albert Renger-Patzsch inspired the young Croxton. Renger-Patzsch had published a book, “Baume,” meaning trees. Renger-Patzsch used a ranger to guide him through the process, looking to capture interesting species and features. Croxton also likes to look at things with a scientific eye, as well as an artistic one. With a graduate degree in forest resources and conservation from the University of Florida, he can guide himself through the jungles of Florida. For him, each cypress dome has a unique architecture. The glades that surround some of those domes are very special places to observe the changing light. Croxton also was inspired by a local artist, Bud Lee. Croxton had gone to school with some of his family members. He was impressed that Lee could make art and income through his passion. In the late 1990s, Croxton began taking photographs. He still uses film and primarily shoots black and white. He started to focus on making color photographic prints from digital images in 2010. Creative Space is a new feature in the Plant City Times & Observer that spotlights Plant City-area artists, musicians, filmmakers and other creative people. If you would like to be featured in an upcoming edition, send an email to Associate Editor Amber Jurgensen, ajurgensen@plantcityobserver.com. 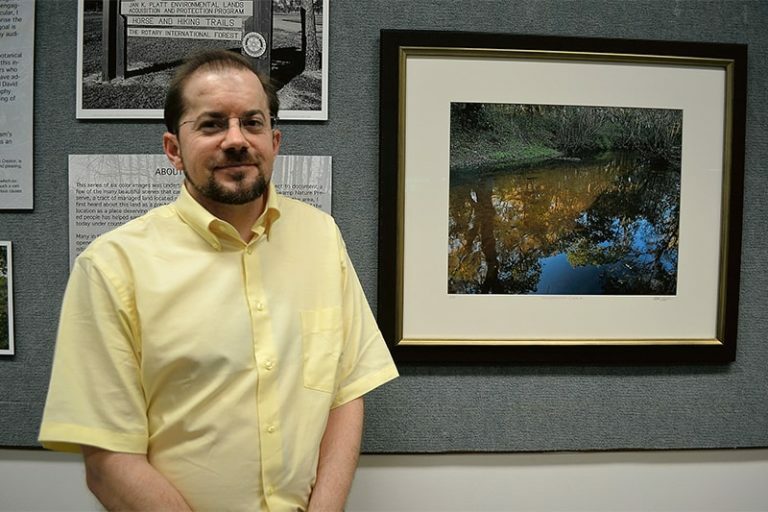 • Matthew Croxton’s inaugural exhibit will be at the Bruton Memorial Library, 302 W. McLendon St., until the end of June. • Prints of Croxton’s photographs can be purchased from Southern Hospitality Furniture and Decor, 1709 James L. Redman Parkway. • Croxton can be reached at matthewcroxton@gmail.com.